As travelers ourselves, we have a genuine interest in the well being, safety and comfort of other fellow travelers. After having witnessed many tourists lose their most important belongings such as passports, cameras, phones, credit cards or cash in parties or other hostels, we have decided to begin a new paradigm of hostels - ones that provide 100% Safety, Privacy and Luxury. Haad Rin Beach Luxury Hostel is our first branch of Dwivedi Luxury Hostels in the line of many to come. Our guests are provided with their very own modern private small rooms, which they can safely lock. The room provides enough space for all your belongings and plenty of room for your own comfort, safety and privacy. Each room includes a lamp, a mirror, a fan, shelves, cloth hangers, charging outlets, clean sheets, towels and a high speed WIFI access. 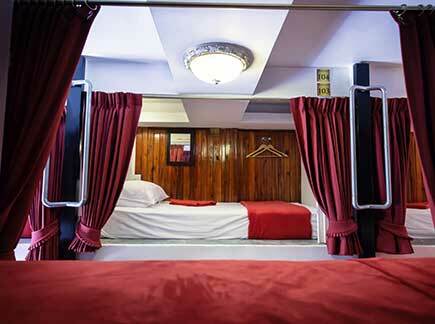 Our small rooms offer our guests a luxury hotel experience in this luxury private room hostel. Bathrooms are fully equipped with modern top of the line facilities, 24-hour hot shower, including shampoo, conditioner and shower gel. We are the closest luxury hostel from the beach so our guests are free to come in and out as they please and do not need to spend their money for taxis or walk far. There are restaurants and cafes offering local cuisines surrounding our hostel in all directions to satisfy all your cravings. The famous Full Moon Party Beach, Haad Rin Beach, also known as the Sunrise Beach is only 30 seconds away by walk and is filled with beach fun activities day and night! Haad Rin Beach is a large white sand beach and it is the best beach to swim in, meet others and hang out all day and night. There is also the most beautiful beach to watch the sunset from, about 1 minute walk from our Luxury Hostel. Because of our close proximity to the famous Haad Rin beach, our hostel is considered the #1 hostel among all Haad Rin Beach Hostels and Hostels near Haad Rin Beach”. 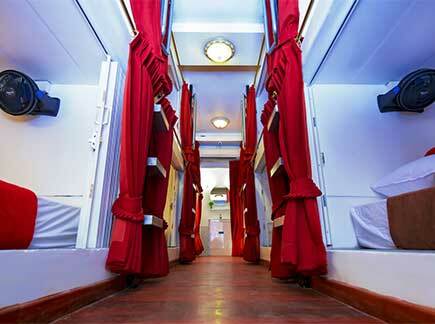 We are a small luxury hostel and accept only up to 24 guests at a time. We have 12 fully equipped small private rooms with lockable door that fit up to 2 people. We operate under a high security standard with 24-hour CCTV cameras in the hallway and a 100% privacy in your room. Every room has a door where you can lock yourself or lock your belongings in and take the key with you. We have high quality mattresses and pillows for our respected guests to get a proper good night sleep after a long tiring day and a warm and friendly staff to give you all the advice you need with free maps and recommendations to make you feel right at home.